His first trout on keiryu. This is a pretty late trip story, considering it was in October. 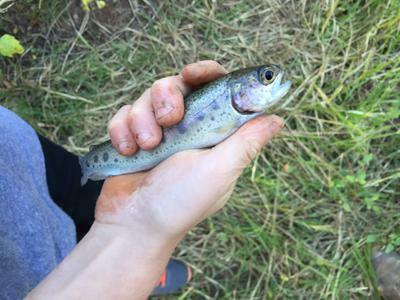 A hunting buddy and I went up to some nearby mountains trying to find bears, it ended up being an unsuccessful day of bear hunting; and since his son and father wanted to come and visit, we drove over to a little mudhole of a trout lake to take them fishing. When we all met at the lake, I pulled out my Nissin 2-Way 450 medium that I stashed behind the seat and quickly realized that I had forgotten my little tackle box at home, but at least brought the line I needed. On asking if my companions had any loose hooks, I was informed that they only use snelled hooks. So I used what we had, and cut a hook off of the probably 15 pound line it was snelled onto. I decided to go to the other side of the lake where I knew I could catch some bullhead, and quickly hooked and lost a fish. I attributed this loss to the hardnes of the cheap foam-bait that I found on the ground while walking to my spot. After changing to some Powerbait, I caught and landed a bullhead. 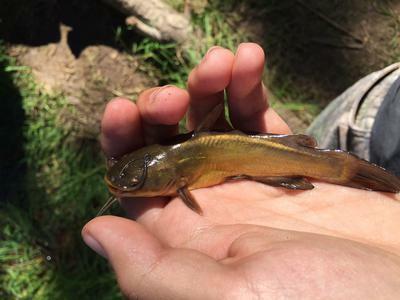 My friend's son saw this from the other side of the lake and come over to investigate, and by the time that he arrived, I had caught another small bullhead. He wanted to try fishing like I was, and within a few minutes fishing with my rod, he caught another bullhead. He soon caught one of the stocker rainbows put in the lake (the first trout between us of the day) and fell in love with the keiryu rod. By the end of the day we caught 5 trout and about 12 bullhead between us, nothing of impressive size, but fun nonetheless. 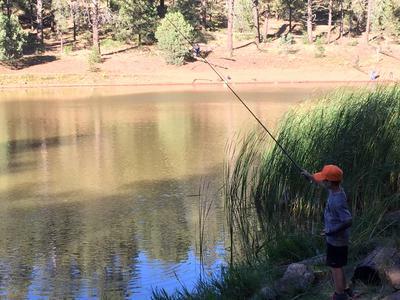 At the time my friends son had a broken arm, really increasing his attraction to the long, one-handed, reel-less rod. Glad you caght some fish and very glad your friend's son liked keiryu fishing. I plan to introduce a Keiryu Starter Kit for Kids this spring. Join in and write your own page! It's easy to do. How? Simply click here to return to Your Keiryu Stories.